A colored topographic map (blue marks low elevations) shows the area around Jezero Crater. Flowing water would have gathered any biologic or organic material from a wide area and deposited it at the crater, making it a logical landing site for a future Mars rover mission. When the next rover begins to ramble across the arid surface of Mars in search of signs of ancient life, where should it look? A team of Brown University researchers is building the case for exploring the Jezero Crater, a spot that was once home to an ancient lake that measured roughly the area of Lake Champlain and was more than 500 feet deep. 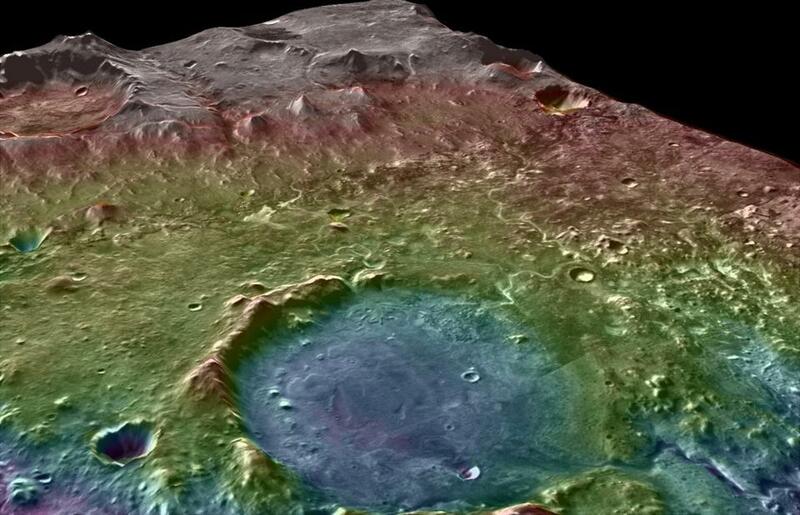 In a paper to be published in the Journal of Geophysical Research: Planets, the researchers report that the region the crater is in had two periods in which water was present. Sometime before 3.8 billion years ago, water would have flowed on the surface, forming rivers and lakes that carried and deposited sediment as we are familiar with on the earth. But the new analysis of photographs and light reflected off the surface of the sedimentary deposits in the former lake tell them that prior to that surface flow, there was at least one other period — most likely when water flowed underground — in which minerals were altered by the presence of water. “We think it would be a really fascinating place to drive around with a rover and do some of the things that you might want to do if you were in the field: look at the sedimentary structure, show how intermittent it was and how much it was flowing,” said Tim Goudge, a Brown graduate student who led the work. Goudge and colleagues pitched the Jezero Crater as a destination for the Mars 2020 rover at a NASA meeting last spring and it was ranked in the top five. In the search for environments that could have supported life on Mars, the presence of water has been a guiding clue. While scientists have long known that Mars has water in the form of ice and once had liquid water on its surface, only recently has it become clearer that water might have been in a form hospitable to life. In 2013, the Curiosity Rover discovered signs of a former freshwater lake the size of the Finger Lakes in New York. There are more than 200 ancient, dry lakes that feature an inlet that would have fed them with water and a drainage outlet. Goudge and his colleagues, however, think the Jezero Crater could be an interesting spot to visit because the sediment was deposited there from a wide area and they can now tell it was wet more than once. Their analysis also suggests that when the lake filled, it was with fresh water. The crater’s lake was discovered in 2005 by Caleb Fassett, a planetary scientist at Mount Holyoke College and a coauthor of the new paper, who noticed a fan-shaped deposit that looked a lot like the Mississippi Delta in images taken by a spacecraft orbiting the planet. The lake had two inlets, on the north and west sides, where sediment was deposited much like it does at the mouth of a river on earth. There was an outlet on the eastern side of the crater where it would have drained. Further research revealed that the sediments contained clay minerals that are created through interactions with water. What Goudge and colleagues had to figure out was whether the minerals had formed at the bottom of the lake or had been carried there by rivers. The new paper, drawing on images from two orbiting spacecraft, shows that each deposit has a strikingly different mineralogical makeup, suggesting the minerals mixed with water and formed outside the lake and then flowed into it from separate regions. Goudge and colleagues will make their second pitch for the Jezero Crater at a meeting in August.